48 Items. Showing Items 1 thru 15. Fits a 6x6mm octagon square, princess or cushion cut stone with 2) 2.0mm accents (stones not included in price but available as an optional purchase). 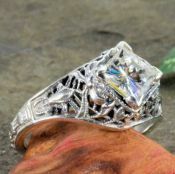 Cast per order using molds of actual antique rings or original hand carved dies and available in 14k, 18k & platinum. Fits 7x5mm emerald shaped stone (stone not included in price but available as an optional purchase). Cast per order using molds of the original hand carved dies and available in 14k, 18k & platinum. 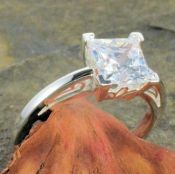 Fits a 6x6mm square, princess or cushion cut stone (stone not included in price but available as an optional purchase). Cast per order using molds of the original hand carved dies and available in 14k, 18k & platinum. Fits 9x5mm emerald shaped stone in a peacock designed setting (stone available as an optional purchase). Manufactured to order using molds from the original antique hand carved dies and available in 14k, 18k & platinum. Fits a 9x5mm emerald shaped stone in a peacock designed setting (stone available as an optional purchase). Manufactured to order using mold from the original hand carved die. Fits a 5.5x5.5mm square or princess cut stone (stone available as an optional purchase). Cast to order using a mold from the original antique dies and available in 14k, 18k & platinum. Fits a 5.5x5.5mm square or princess cut stone (stone not included in price but available as an optional purchase). Cast to order using molds from the original antique hand carved dies. Fits 6x4mm emerald shaped stone (stone not included in price but available as an optional purchase). Cast per order using molds from the original hand carved dies and available in 14k, 18k & platinum. Fits a 6x4mm emerald shaped stone (stone not included in price but available as an optional purchase). Cast per order using molds from the original hand carved dies. 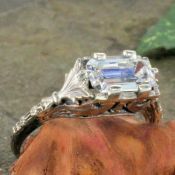 Fits a 12x10.0mm emerald or octagon shaped stone (stone not included in price but available as an optional purchase). Cast per order in 10k,14k or 18k in yellow, white or rose gold. Fits a 10x8.0mm emerald shaped stone (stone not included in price but available as an optional purchase). Cast per order in 10k yellow gold, 10k white gold, 14k yellow gold, 14k white gold, 18k yellow gold or 18k white gold.